HAVING chosen a place for preparing and constructing the Circle, and all things necessary being prepared for the perfection of the Operations, take thou the Sickle or Scirnitar of Art and stick it into the centre of the place where the Circle is to be made; then take a cord of nine feet in length, fasten one end thereof unto the Sickle and with the other end trace out the circumference of the Circle, which may be marked either with the Sword or with the Knife with the Black hilt. 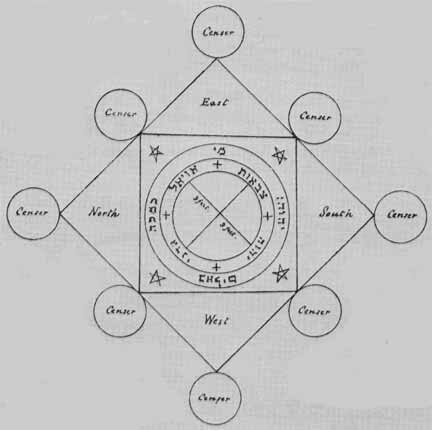 Then within the Circle mark out four regions, namely, towards the East, West, South, and North, wherein place Symbols; and beyond the limits of this Circle describe with the Consecrated Knife or Sword another Circle, but leaving an open space therein towards the North whereby thou mayest enter and depart beyond the Circle of Art. Beyond this again thou shalt describe another Circle at a foot distance with the aforesaid Instrument, yet ever leaving therein an open space for entrance and egress corresponding to the open space already left in the other. Beyond this again make another Circle at another foot distance, and beyond these two Circles, which are beyond the Circle of Art yet upon the same Centre, thou shalt describe Pentagrams with the Symbols and Names of the Creator therein so that they may surround the Circle already described. Without these Circles shalt thou circumscribe a Square, and beyond that another Square, so that the Angles of the former may touch the centres of the sides of the latter, and that the Angles of the latter may Stretch towards the four quarters of the Universe, East, West, North, and South ; and at the four Angles of each square, and touching them, thou shalt describe lesser Circles wherein let there be placed standing censers with lighted charcoal and sweet odours. These things being done, let the Magus of Art assemble his Disciples, exhort, confirm, and cheer them; lead them into the Circle of Art and Station them therein towards the Four Quarters of the Universe, exhort them to fear nothing, and to abide in their assigned places. Furthermore, let each of the Companions have a Sword besides the Sword of the Art, which he must hold naked in his hand. Then let the Magus quit the Circle, and Kindle the Censers, and place thereon exorcised Incense, as is said in the Chapter of Fumigations; and let him have the Censer in his hand and kindle it, and then place it in the part prepared. Let him now enter within the Circle and carefully dose the openings left in the same, and let him again warn his Disciples, and take the Trumpet of Art prepared as is said in the Chapter concerning the same, and let him incense the Circle towards the Four Quarters of the Universe. After this let the Magus commence his Incantations, having placed the Sickle, Sword, or other Implement of Art upright in the ground at his feet. Having sounded the trumpet as before taught let him invoke the Spirits, and if need be conjure them, as is said in the First Book, and having attained his desired effect, let him license them to depart. wherein whosoever entereth he shall be at safety as within a fortified Castle, and nothing shall be able to harm him.